We’d love your help. Let us know what’s wrong with this preview of Revenge by Diane Hoh. When the students at Salem University are terrorized by a vengeful stalker, Addie Adair, a co-ed who is working on an English paper at the computer lab, fears that she will be the next victim when she discovers a strange disk. I've always loved this one, and I had so much fun re-reading it. 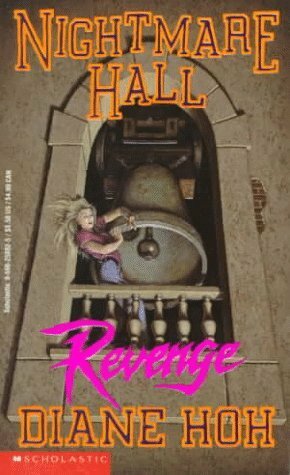 As far as the Nightmare Hall books go, it was a decent series for its target 'young adult' audience. Despite it being a horror novel, it was light enough for teenagers to read. The story focuses on a girl who finds a disc with something odd on it. Mysterious things happen and Addie starts to put the pieces together especially after someone is targeting her. As far as a young adult horror book went, it was all right. This was one scary book. It started off slow, but the last few chapters will have you wanting more. I remember reading this book in school and enjoying it. I recall it was scary in parts. I've been trying to track down a copy so I can re-read it.